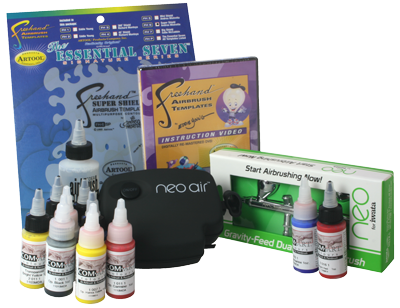 This kit contains everything you need to get started in airbrushing Art & Graphics, including an attractive Neo for Iwata light-duty compressor, a Neo for Iwata CN gravity feed airbrush with 0.35mm nozzle, Com-Art paints, airbrush cleaner, a stencil and an instructional DVD. Neo Series airbrushes to perform well at lower air pressures when used with smaller air compressors. This kit comes with the Neo for Iwata CN gravity feed airbrush by default or you can change it to a Neo for Iwata BCN siphon feed airbrush (add the difference in price between the CN and the BCN). 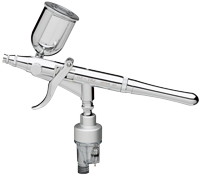 The BCN airbrush is preferred when working in medium to large sized areas with a larger amount of paint. Siphon feed bottles have more paint capacity and since they are interchangeable, extra bottles can be filled with a variety of colours to make for quick colour changes. The Neo Series airbrushes are much better quality than the cheap copies of Iwata airbrushes that are available on the market, and are suitable for beginners to professionals for all applications. However, for the absolute best performance and control, please consider stepping up to an Iwata professional airbrush & compressor kit. The NEO Air for Iwata mini compressor is Iwata's smallest and lightest compressor yet! 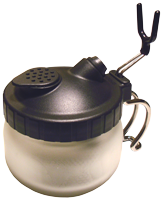 It is light-duty for occasional use, portable for mobile use and priced to suit a tight budget. To protect the motor, the Neo Air compressor will automatically shut-off after 10 minutes of continuous use. If you need a compressor for heavier use, please see the Iwata Studio Series compressors. The Neo Air is equipped with an Automatic Bleed Valve. This lets the motor run safely when the airbrush trigger is not depressed. It features an On/Off button with 3-speed control: Click 1 – Medium setting/Purple Light, Click 2 – High setting/Blue Light, Click 3 – Low setting/Red Light, Click 4 – to turn Off. The AC adapter is 110v - 240v, so this compressor can be taken to be used in countries with either 110v or 220-240v power supplies. Consider upgrading to the light and portable Iwata Ninja Jet or Iwata Silver Jet. The attractive Silver Jet has the advantage of a built in air pressure gauge and it comes with a moisture filter. The NEO Air compressor is suitable for home, mobile or occasional use for up to ten minute sessions. If you need a compressor for heavier use, please click here to see all other art kits.